Country Quilts and Dolls: It's been a long week - or two!! Wow!! Two weeks since I've written anything. In terms of sewing - I've had some "bursts" but not a huge amount of progress on anything. Yesterday was our daughter's birthday - 11 years old. We had a lovely day at home. Originally we planned to go shopping, but it's been so busy that a day at home seemed more of a novelty! We are saving the shopping trip to next weekend. Probably won't be any less busy, but it will be something to look forward to. Our baby turned 3 on Friday. She is such a joy to have - so bright and cheeky. I think that having a toddler in the house helps keep everything in perspective. My daughter has been sewing with our local sewing teacher for about two years now. Last year she made a dress and entered it into the Mt Gravatt Show. She was placed second and then went on to the Brisbane Ekka. So the plan is to do it again this year and time is running out. We've had lots of discussions over what to make and finally settled on a pattern about 3 weeks ago - can't buy it, so it's been ordered. Last Friday we tried again and still "no", so we've gone to plan B. We've picked the material - she's chosen a champagne pink colour. Quite unusual for her - she's always been a pink and purple girl. I'll have some pictures soon. We spent some of yesterday choosing some accessories to make for the dress - a bag and something for her hair. She's cut out the pattern. Now to sew. Esther was invited to the races by friends of ours. So, of course, she needed a hat. It was a rush but we through this together - the wonders of glue!! One of the other events we went to was the World Record for the largest Ballet Class. It was to be on one of the walking bridges in Brisbane, but it was raining so they changed it to the State Library - probably not as spectacular from a photography point of view, but lots of fun. My daughter and her friend participated in it. They think they have enough people to claim the record - but still waiting for confirmation. After a week where I hardly sewed at all, I finally got back into it last week. 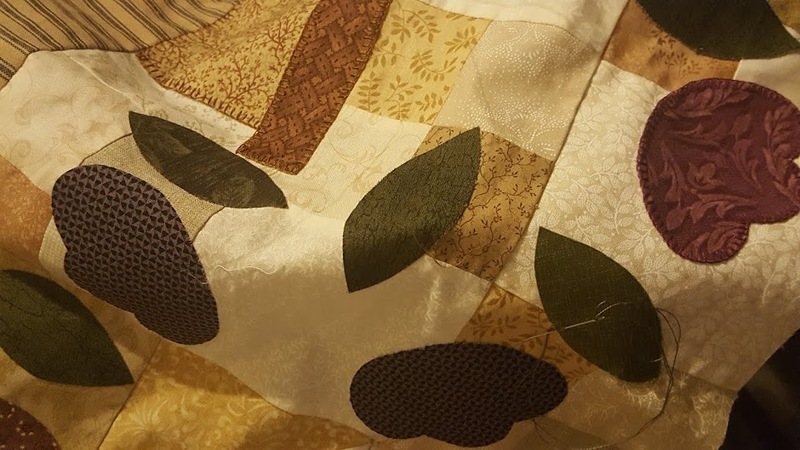 I had a day's class working on a quilt using Sewing Revolution and Sewing with Wendy. It's all machine work and uses machine embroidery with applique. I have blocks sorted out for that now - need to get some sewing done at home. My second class this week was applique. Once again with Wendy. We've been working on fabric weaving. This week we made a bag. I finished it last night. This was the bag. Quite simple really, but lots of fun to make. My third class this week was at Homespun and Beautiful - a class conducted by Patrizzio Di Marco (hope the spelling is right!). It was a fun day - but lots of homework. I contacted Terease at Homespun and Beautiful about doing the class and asked he if she could choose some fabrics for me as I knew my time was limited. She has chosen the most gorgeous colours. She had two different colour ways selected - both were lovely. I'e gone with the brights, but would love to do it in the more muted shades as well. We've been taught the best way ever to do Flying Geese. In two weeks time we're going to be learning how to make mitred borders. So the pressure is on to do lots of homework and get the top together! Last night I completed 5/24 of one block and 3/15 of the other. These are how they will be arranged. Don't you just love design boards - already talking to DH about making one big enough for a full sized quilt. In hand sewing I've been continuing with Gardener's Journal. But making slow progress. Hardly had any time to make hexagons at all. My other BIG sewing commitment in the last fortnight was to make some costumes for the Rock Eisteddfod that my second son is performing in. 20 completed and about 8 to go. It's a simple pattern and with an overlocker it was a breeze to make - but still took two days to finish them. Not sure how much is left to do as I haven't been to the parent meetings. DH's health appears to be improving. He hasn't had any chest pains for over a week now. The Stress Test Result was a good one. It still doesn't totally clear him but the doctor believes that with the results it is unlikely to be heart. May have just been a virus. We're still taking it as a warning and making some health changes as a result. Trying to get some more exercise in, etc. I've missed lots of my regular entries in blogging during the week - Tuesday's Treasures, One Flower Wednesday, Teddy Bear's picnic. Hopefully this week I'll be more organised. I'm hoping to get back to my bear this week. Hoping to get back to class with her this Friday. Maybe some progress to report soon. It's raining here today - wish we could send some to Chooky Blue and all the others who really need it. We don't right now, but I know how quickly that can change. Cheers - hope everyone has a great week. Happy Birthday to your gorgeous girls!! I adore that hat. Your quilt looks amazing - so feminine and fresh! Love it!